Why reconstruct this museum exhibit from 1813? Is there a connection between this exhibit and Jane Austen's fiction? Who, other than the Austens, attended this 1813 exhibit? How did visitors in 1813 experience the British Institution? Did the Catalogue function as a museum guide in 1813? How historically accurate is this website? On 24 May 1813, Jane Austen visited an important and much-talked-about art exhibit at the British Institution in Pall Mall, London. The show was a retrospective of the works of Sir Joshua Reynolds (1723-1792), England's celebrated portrait painter. No visual record of this show is known to have survived, although it attracted hundreds of daily visitors during its much-publicized three-month run. However, many details of the exhibit can be reconstructed from the original 1813 "Catalogue of Pictures," a one-shilling pamphlet purchased by visitors as a guide through the three large rooms where hung 141 paintings by Reynolds. Armed with surviving copies of this pamphlet, narrative accounts in nineteenth-century newspapers and books, and precise architectural measurements of the British Institution's exhibit space, this website reconstructs the Reynolds show as Jane Austen (as well as any Jane Doe) saw it. I. Why reconstruct this museum exhibit from 1813? In truth, even if Jane Austen had not attended this public exhibit, it would still be well worth reconstructing. The British Institution's show was a star-studded "first" of great magnitude for the art community and a turning point in the history of modern exhibit practices. The 1813 show amounted to the first commemorative exhibition devoted to a single artist ever staged by an institution. Although Reynolds, who had died a mere twenty-one years earlier, did not yet qualify as an Old Master, he was already hailed as the founder of the British School and celebrated as a model for contemporary artists to emulate. The preface to the exhibit catalogue, written by Richard Payne Knight, treats the work of Sir Joshua Reynolds as a national treasure in order "to call attention generally to British, in preference to Foreign Art" (Knight, 9). Knight allows that some of Reynolds' paintings are better than others, likening the show to a pedagogical tool for artists and connoisseurs. He also insists upon the show's modernity, hailing "the genuine excellence of modern" artists over the work of their forbearers (Knight, 9). In light of the coverage it received in the popular press and the London crowds that attended, the British Institution's Reynolds exhibit presaged the modern museum blockbuster. In the age before the photograph, portraits of the rich and famous were often reproduced by engravers as inexpensive prints. These black and white reproductions circulated Reynolds' images of contemporary celebrities widely, providing pinups to the middling consumer. In this manner, Reynolds' works functioned as the modern photographs of Annie Leibovitz do today, making it hard to say whether he recorded or created celebrity with his art. Wherever possible, the light-boxes in the e-exhibit therefore show an early engraving as well as the original canvas. Reynolds' portraits of "abnormally interesting people" whom we now term celebrities offer concrete examples of just how someone like Austen, who did not personally circulate among the social elite, was nonetheless immersed in England's vibrant celebrity culture (Roach, 1). II. Is there a connection between this exhibit and Jane Austen's fiction? Austen's general interest in the art of painting is well-known. She famously described her own writing in a metaphor borrowed from miniature painting: "the little bit (two Inches wide) of ivory on which I work with so fine a Brush" (Letters, 323). These 141 paintings by Reynolds, because viewed by Austen in person, open up the tantalizing possibility of tracking the show's influence to specific allusions in (or influences upon) her fiction. Whether by coincidence or design, Austen's work is heavily populated by the names of sitters in these portraits. Moreover, Reynolds arguably makes his own cameo appearance in Pride and Prejudice, which was published by Thomas Egerton just a few months earlier—and first advertised on 28 January 1813. In Austen's novel, a Mrs. Reynolds tours the heroine through Pemberley's portrait "gallery," providing a verbal portrait of Mr. Darcy that alters prior opinion and turns the story (Jones, 431). Although the aptly named Mrs. Reynolds remains a minor character, the information she offers is the lynchpin in the novel's main romance. Ultimately, it is Austen herself who playfully connects her visit to the Reynolds retrospective with her fictional characters in a letter to her sister Cassandra, dated 24 May 1813, where she writes of that day's plans to visit several art exhibits. In the letter, she turns these visits into a virtual search for portraits of "Mrs Bingley" and "Mrs Darcy." She writes being " very well pleased ... with a small portrait of Mrs Bingley, excessively like her" in the Exhibition in Spring Gardens, but that she has not yet found "one of her Sister ... Mrs Darcy." Although she declares that there is "no chance of her in the collection of Sir Joshua Reynolds's Paintings which is now shewing in Pall Mall, & which we are also to visit," she jokes "I dare say Mrs D. will be in Yellow" (Letters, 212). Even if Austen, known for her ironic wit, did not mean for these words to be taken literally, she licenses, as it were, a search for the portraits of her imaginary characters among the pictures in this gallery. III. Who, other than the Austens, attended this 1813 exhibit? The Reynolds exhibit opened at the British Institution's so-called Pall Mall Picture Galleries on 10 May 1813 and closed on 14 August 1813. Official gallery hours were "Ten till Five," although these were extended during the busy opening by two hours on either side of that window (Morning Post). The Institution hired extra attendants for the duration and installed railings to better protect the valuable pictures from expected crowds. The Prince Regent was the guest of honor at a red-carpet opening reception on the evening of the 8th of May, which was attended by celebrities such as Lord Byron and Sarah Siddons (who could admire her younger self hanging in the gallery). A posh dinner at Willis's, formerly Almack's, followed, to which the guests walked under a protective awning. During the show's early weeks, it proved so popular that it drew up to 800 visitors per day. Candle-lit evening openings at irregular intervals during the three-month run further attracted "much fashionable company" (Haskell, 56). The Royal family enjoyed a private visit on 30 June 1813, with newspapers reporting that the party "all appeared highly delighted" and lingered in the gallery "about an hour" (Morning Chronicle). The letters of novelist Maria Edgeworth record that she, too, attended the Reynolds show. This exhibit would appear to have been the cultural event of the season. IV. How did visitors in 1813 experience the British Institution? Thomas Rowlandson (1756-1827), British Institution, Pall Mall, 1808. Aquatint on paper. "Pub. 1st April 1808, at R. Ackermann's Repository of Arts." Just so, we encourage a visitor to this website to use the 1813 Catalogue to guide them through the display of 141 Reynolds paintings—starting with the whole length portrait of George III, which was "No. 1 at the North end of the North Room." V. Did the Catalogue function as a museum guide in 1813? Yes. The Austens, like all visitors to the show, likely purchased a copy of the 1813 "Catalogue of Pictures" for one shilling to guide them through the exhibit's "North," "Middle", and "South" rooms where hung the 141 paintings on display. A visitor to this e-exhibit is similarly urged to use its list of pictures to guide them through our virtual reconstruction. The full Catalogue consists of a 20-page booklet that opens with a lengthy membership list of the British Institution as well as a laudatory preface by Richard Payne Knight. We did not reproduce these extensive prefatory materials. The remaining pages in the 1813 Catalogue (reproduced on our site) identify each picture by title and owner. Unfortunately, unlike old books and their bound title pages, paintings often lose or lack physical labels. Many of the original titles assigned to Reynolds' 3,000-plus paintings have changed with shifts in ownership. Whereas the exhibit catalogue identifies most pictures simply by the names or aristocratic titles of the sitters, marriages and promotions had already affected some names by 1813. For example, canvas No. 21 in the 1813 show, where it was entitled "Portraits of Lady Lucas and Lady Grantham," is now known as "The Ladies Amabel and Mary Jemima York." Relying upon the excellent two-volume Complete Catalogue of Reynolds' work by David Mannings (Yale, 2000), this website identifies all the images in the show by their current titles and known location or owner. These paintings are now spread out over such a wide geographical area that ever reconstituting what Austen saw in real space and time seems impossible. This is precisely what spurred our website's goal of a historical e-recreation. Over the show's three-month run, from 10 May to 14 August 1813, the paintings on exhibit were altered slightly in number and arrangement. The show closed briefly in the middle of June for a reorganization that accommodated late arrivals. The multiple editions of the Catalogue (Mannings mentions four) record these changes, with the total pictures increasing to 143 in later versions and most of the shifts and substitutions occurring in the South Room. Since Austen saw the show ten days after it opened, allowing for a few early tweaks but not the June expansion, this website honors the second edition of the Catalogue as its virtual copy-text—which still shows only 141 paintings. Please note that our 1813 e-Catalogue contains an authentic error: it labels the final wall in the South Room wrongly as "East End." This was corrected in later editions to "North End" and is treated by our site as a straightforward misprint in the original document. The pages from the exhibit Catalogue reproduced here came from a copy in the Sterling and Francine Clark Art Institute, Williamstown, Massachusetts. VI. How historically accurate is this website? Relative sizing throughout this virtual reconstruction has been determined, wherever possible, from exact measurements in the historical record. The design team fed these precise dimensions into Google SketchUp, which generated a three-dimensional blueprint of the exhibit space that allowed us to hang the individual walls of our e-gallery. Although accurate, the cold SketchUp model generated an aesthetic that was out of keeping with a Regency-era recreation. So, specific views in this SketchUp model were frozen and served as templates for warmer, hand-drawn renderings of the individual walls, into which the images of the paintings were then digitally reinserted. We styled our website's final look after the Rowlandson print from 1808, allowing a near-Regency aesthetic and color palette to modify the all-too-modern appearance of our original digital tool. We struggled with seemingly small details, including whether or not to include in our e-gallery a guardrail mentioned in the historical record. 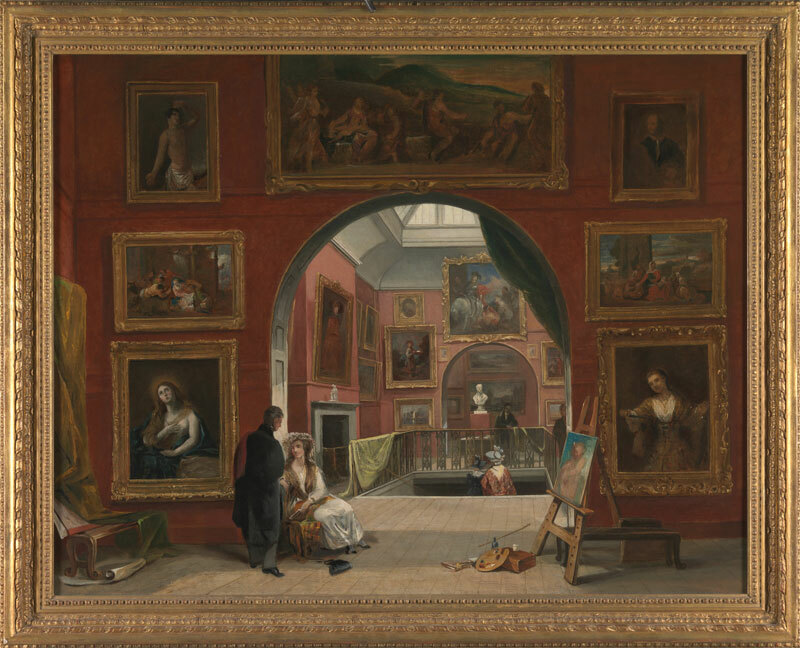 On 4 May 1813, tighter security measures were deemed necessary to protect the borrowed Reynolds pictures from expected crowds: it "was ordered that the Rail round the Room be brought six inches further into the Room, & raised to the height of three feet" (Stefanis, n44). We decided not to include this three-foot-high rail that would run like a dark line through the paintings in our e-gallery, obscuring the views of the canvasses for the e-audience when the original visitor would simply have stepped up to the low guardrail to peer over it. Similarly, we fussed over how historically accurate and varied our picture frames should be. Our final views hint at variety, using details merely as helpmates to the viewer's imagination and not as definitive historical recreations of specific framing styles. How were the paintings attached to the walls? 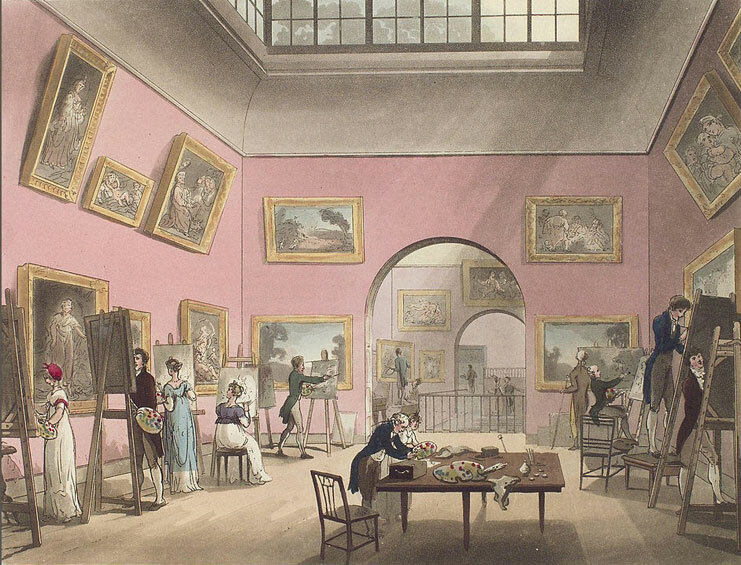 Rowlandson's print, as well as the later canvases of the interior space by Davis and Woolmer, suggested to us that the British Institution likely hung paintings from hooks, rather than suspend them from picture rails by wires, so no visible wires in our gallery. John Scarlett Davis (1804-1845), The Interior of the British Institution Gallery, 1829. Oil on canvas. Yale Center for British Art, Paul Mellon Collection. Alfred Joseph Woolmer (1805-1892), Interior of the British Institution (Old Master Exhibition, Summer 1832), 1833. Oil on canvas, Yale Center for British Art, Paul Mellon Collection. We nearly overlooked a fireplace in the Middle Room. 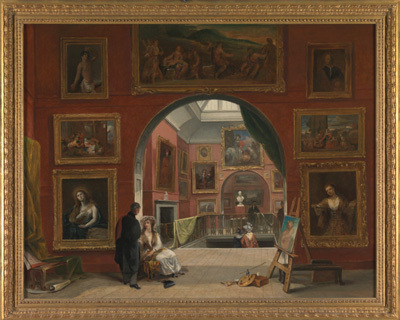 The Woolmer painting, dated 1833, is the only interior view of the British Institution that shows a fireplace. This is because it shows the gallery from the North Room looking South, giving a rare glimpse of the Middle Room's East wall. With no visible fireplace in the Rowlandson (1808) or Davidson (1829)—since both of these perspectives are from the South Room looking North—we would never have known about the existence of a fireplace if it were not for a work painted two full decades after the Reynolds show. While we briefly suspected this feature to be a subsequent addition, architectural logic suggests that a substantial fireplace on a second floor would not have been an easy feature to retrofit, since it would demand foundational support. Also, only when we added the fireplace into our designs for the Middle Room did the paintings on the East wall divide easily into a balanced arrangement. 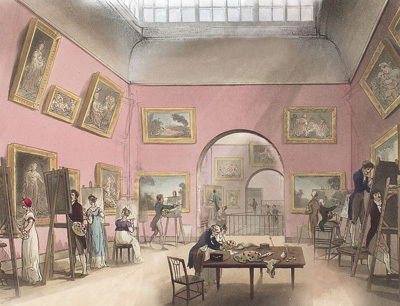 The Rowlandson print of 1808 determined our site's overall look and color palette, yet shows more generous spacing on the British Institute's walls than the sheer number of Reynolds canvasses allowed for the 1813 show. We assumed that, given contemporary models, the hang would prove dense and crowded. 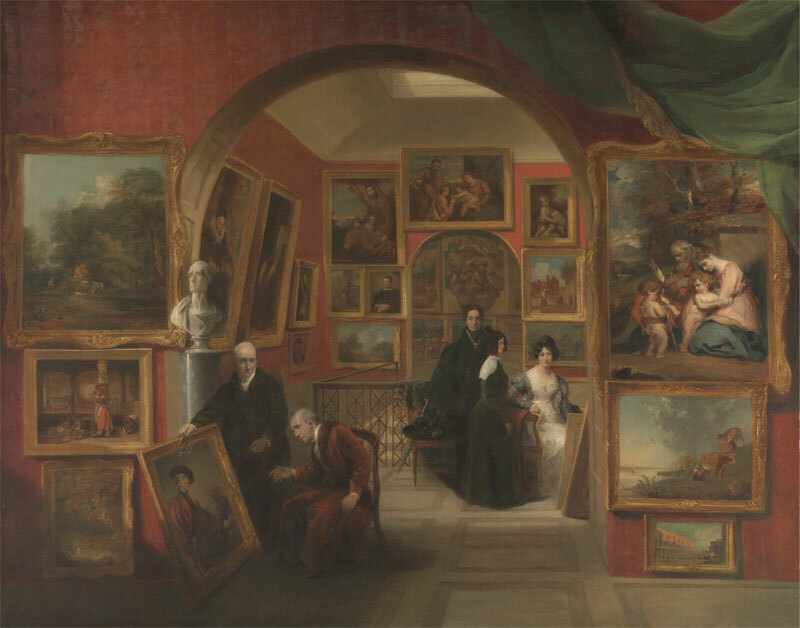 After all, at the Royal Academy pictures were hung with frames touching, filling all available space from baseboard to ceiling. The elegant Reynolds show, however, proved more sparsely hung than these other venues, perhaps influencing modern museum practices in yet another way. Provocatively for a commemorative one-man show, Reynolds' work was displayed thematically rather than chronologically, although dates of the pictures were provided in the catalogue. "Everything suggests," observes art historian Francis Haskell, "that the paintings were hung in accordance with social protocol, combined with the need for symmetry and a general pleasing effect" (Haskell, 54). Members of the royal family are indeed, as protocol demands, given central placement. The "portrait of His Majesty," George III, is aptly labeled number one in the catalogue, marking the king as the formal starting point of the exhibit. Reynolds' portrait of Queen Charlotte hangs directly opposite, on the south wall in the South Room—allowing the royal couple to gaze at one another from the far ends of the gallery. Between them they neatly survey, as it were, gallery visitors in the same manner in which they might have hosted a grand dinner party—with their eldest sons taking pride of place along the sides. But even such obvious concessions to protocol allowed for strong interpretive gestures from the show's original curators. For example, the striking juxtaposition on the starting wall of whole length portraits of George III and Sarah Siddons, seated dramatically beside him on her own throne, allows the celebrity actress to, well, steal the show. This particular portrait, in which Siddons strikes a pose reminiscent of the Prophet Isaiah on the Sistine Chapel ceiling, was extravagantly praised by critics and remains, arguably, Reynold's best-known work. Two years into a Regency that reconciled England to the reality of a mad king, Siddons is positioned as the reigning celebrity of the retrospective, even if propriety demands that the-king-in-name-only take precedence as canvas number one. Because of her presence on the starting wall, Siddons' prominent hold over the show is indisputable, no matter how precisely the original curators hung the five canvases on the North wall of the North Room. Nonetheless, there are several possible arrangements of that wall, each of which give a slightly different emphasis to Siddons' presence. We sweated over the options, although the numerical sequence of the catalogue and the canvas measurements restricted those options to but a few. (For an illustrated discussion of those choices, see the March 2012 article about the development of this site in the ABO: Interactive Journal for Women in the Arts, 1640-1830.) While pondering our options, we realized that the original curators who hung the 1813 show had to have made similar calculations about balancing visual symmetry with social signal. Artistic symmetry, celebrity prominence, and social precedence compete for dominance on every wall in the exhibit. The e-gallery's virtual labels aim to provide the type of information that a Regency visitor like Austen, who was well-informed about the peerage, politics, the navy, and even royal scandal, might have known about the famous sitters in these portraits. Seeing the original art in situ thus allows a modern visitor to witness the hidden narratives embedded in the show's curatorial decisions. The curators of the 1813 show, doubly burdened by rumor and politics, arranged the prominent sitters on the walls so as to maximize the celebrity appeal for visitors while minimizing any irritation for the paintings' actual owners (note how the then-current owners are given equal billing in the 1813 Catalogue with the original sitters). One final curatorial caveat. The internet allows unprecedented access to visual images, including access to many of these 141 canvases—in spite of their dispersal throughout the globe in museums and private collections. In many cases, this site simply gathers together images of individual paintings by Reynolds already freely available on the internet. A handful of paintings remain untraced even in Mannings or have been destroyed by fire; these lost images are represented in our e-gallery by a framed question mark. Where a good image of a traced painting was not available, the canvas is represented by their early reproductions as popular black-and-white prints. Color aside, these engravings often cropped or adjusted the portraits, so may not accurately render the whole canvas image. Color and tones, of course, can also differ greatly for e-images of even the same painting. Where more than one copy of the same painting is known to exist (Mannings records how Reynolds' studio occasionally made multiples for different clients) we selected the best available image, regardless of which Reynolds copy hung in the gallery in the 1813 show. Perhaps these visual approximations can, in time, be substituted for with good color scans of the precise material objects that Jane Austen saw on 24 May 1813. Austen, Jane. Jane Austen's Letters. Ed. Deirdre Le Faye. Third edition. Oxford: Oxford University Press, 1995. Print. Haskell, Francis. The Ephemeral Museum: Old Master Paintings and the Rise of the Art Exhibition. New Haven: Yale University Press, 2000. Print. Jones, Vivien, ed. "Notes." Pride and Prejudice. By Jane Austen. London: Penguin, 1996. Print. Knight, Richard Payne. Preface. Catalogue of Pictures by the Late Sir Joshua Reynolds. British Institution for Promoting the Fine Arts in the United Kingdom. London: Bulmer, 1813. Print. Mannings, David. Sir Joshua Reynolds: A Complete Catalogue of his Paintings. 2 vols. New Haven: Yale University Press, 2000. Print. Morning Chronicle (London), June 30, 1813. Issue 13775 in 19th-Century British Library Newspapers, Part II (Gale). Online database. 14 Feb. 2012. Morning Post (London). 13 Aug 1813. Issue 13165 in 19th-Century British Library Newspapers, Part II (Gale). Online database. 14 Feb. 2012. Roach, Joseph. It. Ann Arbor: U of Michigan P, 2007. Print. Smith, Thomas. Recollections of the Rise and Progress of the British Institution. London, 1860. 19-20. Print. Stefanis, Konstantinos. "Reasoned Exhibitions: Blake in 1809 and Reynolds in 1813" Tate Papers: Tate's Online Research Journal Number 14 (Autumn 2010). Web. 12 Feb. 2012. This project is generously supported by Liberal Arts Instructional Technology Services (LAITS) at the University of Texas at Austin.